There was a weekly gathering place for Jews in Mount Vernon: a rented, second-floor apartment above the present-day Jordan Quilt Shop. Mrs. Zelkowitz adds: “I know one thing. I finally ended up with it in my apartment at 512 ½ East Chestnut. We rented an apartment, and I was so horrified, it was eighteen dollars a month, and I thought that was astronomical.” Mrs. Zelkowitz’s grandfather, Mr. Kalmon London, was the first Orthodox spiritual leader in Columbus. She organized services herself in Mount Vernon. They had a Torah, which includes the first five books of the Bible, which is the sacred book of Jewish teachings. Although a rabbi (a legal and spiritual guide for the community) was beyond the community’s economical means, “there were some Jewish gentlemen that were very well-informed,” to lead the services. However, for the High Holidays, people went to Mansfield or Columbus. 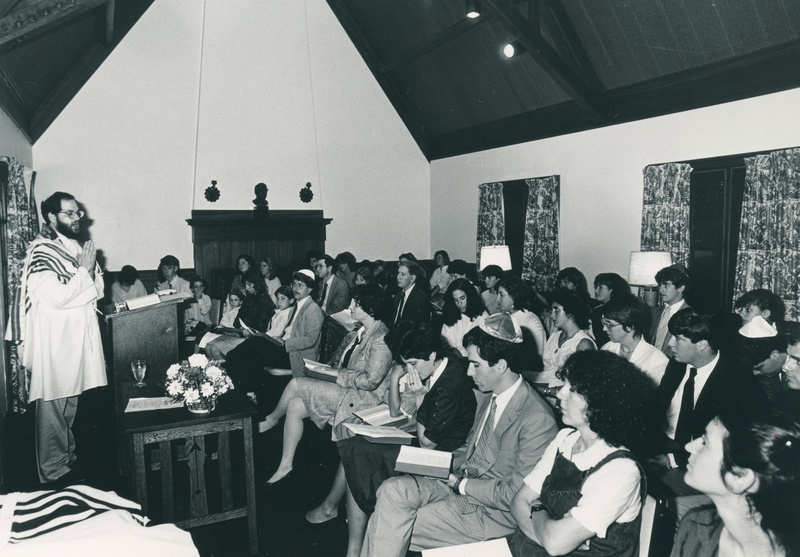 Kenyon Hillel Rabbi Lenny Gordon conducts services at Weaver Cottage, ca. early 1980s. During this period, Mount Vernon was relatively more isolated from other cities and towns than it is today. Mrs. Zelkowitz describes her mother’s opinion of her new home: “Oh, my mother was fit to be tied. My mother said to her friends her daughter’s in some little country town.” Yet, it was this very isolation, in part, which made it necessary for the community to form strong bonds. Its members helped each other out with such difficulties as keeping kosher. Kosher food follows Jewish dietary laws and must be properly prepared. For example, meat must be slaughtered in a certain way and may not be eaten with milk. Another difficulty was attending synagogue and religious instruction. “I attended Sabbath School here. And then, I imagine it was because of a lack of families, they gave up the Sabbath School here.” When this happened, a gentleman of the Jewish community, “every Sunday morning would load up his car with any of the Jewish children that were willing and took us to Mansfield, which did have an established synagogue, and we went to Sabbath school there,” Susan continues. Sabbath is the seventh day of the week, and starts with sundown on Friday and lasts until sundown of the following day. It is a day dedicated to God, a holy day of rest. One gentleman taught Hebrew in his home, key in training for children’s Bar or Bat Mitzvah. A Bar or Bat Mitzvah is the occasion when a boy (Bar) or a girl (Bat) is confirmed into the Jewish faith, age thirteen for a boy, twelve and a day for a girl. With time, members of the earlier Jewish community moved away in search of work, in search of a larger Jewish community, or passed away. The emphasis for those remaining, as well as those who moved into the county, is placed upon carrying on traditions in the home and instead of in public gatherings. Sarah, having recently moved here from a large city, illustrates how the home and family are truly important in the Jewish tradition. “What beauty there was in the family and how Judaism related to the family; that part of it I have always felt very connected to. When I would go back for Passover [a spring holiday celebrating the Exodus of the Israelites from Egypt. It lasts eight days, during which the Jews refrain from eating all leavened foods and products] or whatever thing I went back for, the warmth of the family and the family’s orientation towards the religion is probably the most important part of it. It brings them together; it’s a way of passing on from one generation to the next who you are and I want to be able to participate with my family in that process.” Many rituals, such as those for the Sabbath with the lighting of the candles, are traditionally performed within the home, thus allowing observance to be carried on in private. The fact that there are so few Jews in the county has reinforced the desire for people to practice their traditions. Having grown up in New York City, Robert asserts, “The longer we [my wife and I] were here, the more we realized that the assumptions of this community were the exact opposite of the ones we each grew up in. Our assumption was that everybody was different, and the assumption here was that everybody was the same. So we were always understood by the rest of the world to be not-Jewish.” The question becomes, “How come you forgot to take me into account? Again?” The issue of not being acknowledged comes in many forms, from ham (which is not kosher food) and eggs being served at a breakfast for Jewish students at Kenyon College, to the annual winter concert at the Wiggin Street School in Gambier being called a Christmas concert. Note: This story was part of a student field research project, Living Together: Rural Diversity in Knox County, Ohio, conducted at Kenyon College in 1998-1999. Names have been changed at the request of the individuals, with the exception of Helen Zelkowitz.